Making perfect pork chops is simple — first, we sear them in a very hot pan for about three minutes, then we flip them and cook them the rest of the way in the oven. Preparing them this way ensures that they're cooked, but not overcooked. So they'll be nice and juicy and tender. Part of this is choosing the right pork chops. For this recipe, the best ones are bone-in pork chops that are an inch thick. Too thin and they'll be overcooked. Having the bone contributes flavor and moisture, which means a juicy pork chop. Because we cook on the stovetop and then the oven, and because we need to get the pan super hot, a cast-iron skillet is an ideal pan for making these pork chops. For more on why it's okay to cook pork chops medium, rather than well-done, see How to Cook Pork. Twenty minutes before you start cooking, remove your pork chops from the refrigerator and let them sit at room temperature. Thoroughly dry the pork chops with paper towels. Heat an oven-proof skillet (cast iron is ideal) on the stovetop for about 5 minutes. It's really important to get the pan as hot as you possibly can before adding the chops. Once the pan is good and hot, add about two teaspoons of high-heat vegetable oil. The pan will immediately start to smoke, but don't lose your nerve. Add the pork chops to pan and don't move them for 3 minutes. Now flip the chops over with a pair of tongs and transfer the pan to the oven. Roast 6 to 7 minutes. Now, test for doneness by pressing your thumb in the center of one of the chops. It should spring back firmly against your thumb. If it feels soft, let it roast for another minute. Remove the pan from the oven, transfer the chops to a plate and cover with foil. Let the chops rest for 3 or 4 minutes before serving. The best cut of meat for this recipe is a bone-in pork chop about 1-inch thick. Make sure to bring your chops to room temperature before cooking. Figure on taking them out of the fridge about 20 minutes beforehand. 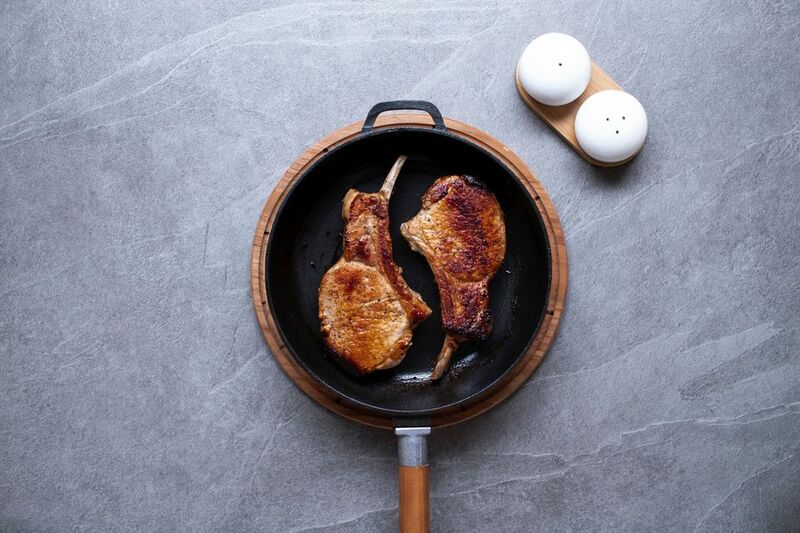 Use a cast iron pan when cooking, as that will enable you to cook the pork chops on the stove first, then transfer them to the oven without having to switch pans. If you are using cast iron to cook these chops, please be careful to use pot holders when touching the handle of the pan. Especially when it comes out of the oven.